Sorry Kevin just a bit of a rant …. Thanks once again, Paul. Yes I totally agree about the Rock and Roll Hall of Shame. I was interested to hear one of the band recently (was it Jon Anderson or Chris Squire?) being quite cool about not getting in. I think the real artists out there know it’s just marketing fluff and in the end great music will endure, despite awards etc. 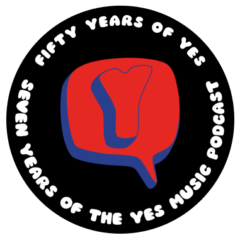 Every time I re-listen to something like Yesshows I’m reminded how far ahead the band are of most of what was happening at the time – or has happened since. However, it is still a travesty that Yes are overlooked every time. It’s great to know you are out there listening, Paul! Mmmm, yes that is an interesting one. From what I’ve heard so far, I think he is capable of putting his own stamp on the music – and he will certainly play it his way – if he plays it at all. I’m not sure how it would come over. Love to hear them try though! Next Next post: Episode 39 – 1st Yes Music Podcast Quiz Results!